SkyGlaze (Modern color from a light blue to a light gray, quite common - was intended to blend with the sky to be less noticeable on utility poles). Uniform chocolate brown or modern "sky glaze" insulators are usually less desirable unless they are of an unusual style. "Snow white" insulators are slightly more desirable than brown. Many of the earliest dry process and wet process insulators (1880-1900) are white or off-white in color. Imperial, General Electric, Peru, Fred Locke, and R. Thomas and Sons all produced mostly white insulators until the turn of the century, when brown glaze came into favor to deter vandals. Many white insulators actually have clear glaze, and the white ceramic of the insulators shows through. Some of Fred Locke's insulators actually had an opaque white glaze. Mottled gray insulators are very desirable to collectors. Victor, Thomas, and Ohio Brass produced classic insulators in this color in the 1910s. Keep in mind this does NOT include uniform white or "sky glaze" insulators of recent production. Mottled butterscotch insulators were characteristic of Thomas in the 1910s. These pieces can be quite beautiful. This is a very impressive color on a large four part multipart! Earlier insulators will have mottled, or swirled glazes, as compared to the more modern uniform glazes. Earlier glazes may also have specks, grains of sand embedded, swirl marks, spiral marks, and drip lines. They simply look cruder and are pretty reliable as an indicator of age. Mottled glazes are prettier, and can sometimes add value to the insulator. "Pumpkin brown" insulators are very characteristic of Lapp insulators of the 1930s to 1940s. This color is uniform, and is also called pumpkin orange or butterscotch. 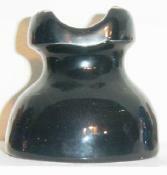 Most Lapp insulators are underglaze ink marked "LAPP" with a number beneath.